We have many prints of lighouses for sale by different artists. This is Bo Cronqvist version. 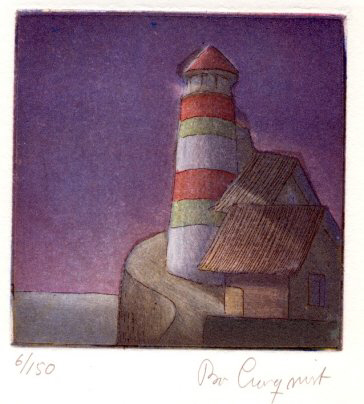 He has made a lovely print of a Swedish lighthouse by night showing the way for many a sailor. This print would do fine on a well somewhere in your home - wouldn't it? This is an original hand-pulled etching, and the print is signed and numbered by the artist. The size of the edition is 150. Picture area size: 10*10 cm (3,9*3,9 inch). Paper size: 22*22 cm (8,7*8,7 inch) (not showed in full on the screen).